In the Spring of 2005, Famous Grouse Innovation and Development Manager Helen Potter was workshopping in Sweden when the idea of a peated, Islay-style version of the world-renowned blend was first realised. Interviewed by Mark Gillespie in the excellent Whisky Cast (Episode 106), Potter explained the inspiration behind the new expression from Edrington Group's flagship blend. She said her research showed that new and younger drinkers were skipping blends, the traditional entry-point into the wide world of whisky, and, instead, moving straight to strongly flavour malts, ie. sherried beasts and, in particular, Islay malts. This blend hopes to appeal to those drinkers with an emphasis on added drinkability while being a little gentler on their wallets. In general, minimal marketing speak. We like. Famous Grouse is the number #1 selling blend in Scotland... and in Sweden. Sweden has a pretty sophisticated whisky market, are generally big spenders, and 30% of all malt sold in Sweden is from Islay so it can safely be said that their tastes are, by and large, for the peated side of things. Liquor is controlled and sold through a state-run organisation called the Systembolaget (like Vinmonoplet in Norway, LCBO in Ontario, etc.). 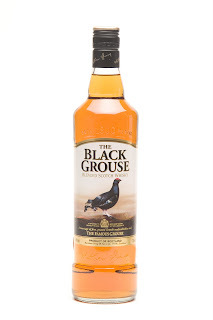 Advertising controls of alcohol in Sweden force companies to rely on making news to stimulate interest and this gradual pilot-ing of the product have achieved that goal in Sweden where the Black Grouse has been sold since being launched in April, 2007. Before Christmas the rest of Scandinavia and selected European markets should be able to get their hands on a bottle. Folks in other countries will have to wait... if the stuff comes at all. And who knows if we want it!? Lets taste and find out. All Famous Grouse had on the mission can be read HERE. * - as this product is not available in UK, the price is based on RRP in Sweden. Posh, sweet nose of fresh crumpets, cream, peach and strawberry jams. Stones, minerals like decomposing matter, ie. peat, and a touch of smoke. Very well behaved aromas of fresh apple, black pepper, and ice cream sandwiches. Chewy sweetness, cereal grains, and a soft growth of peat and smoke. With water, this mineral smokiness is more pronounced. Gently drying with a disappearance of flavour. In the interview cited above, Helen Potter described this whisky as "smoke in the nose, smoke on the palate, smoke in the finish." For me, the smoke was so faint in any stage of the tasting of this dram that to use it as a descriptor seems inaccurate. I get peat, and earthy matter appears in the mouth, but if we go into this expecting a smoky whisky, we will be sadly disappointed. None of this is to say that this drop is not enjoyable, though; it is a solid blended whisky. The nose is really appetising and becomes a spiced-up version of the standard Grouse with pepper, the aromas of tree bark and (faint) peat. The palate gives the most smoke, but it is still just a whisper in the full conversation of the whisky. A bit of a non-event between the palate and the finish, like a standard blend should be, encouraging healthy(sic) sips in quick succession.